Along with the development of these new colored stone patterns came innovative finish selections as well. Plastic laminate creators started making the sheen of the Formica just like real stone and some companies even created small pits on the surface of the laminate (see image above). These little indentations really became a desirable item, but because of the laminate’s uniqueness, the pit finished Formica came with a higher price tag. Not long after the flood of granite Formica colors hit the market, post-form countertops began to advance in popularity as developers started laminating them with the new granite patterns. Lowe’s stock countertops began to increase in popularity as the demand for the stone patterns continued to climb. Because the post-form style has the rolled over edge, many people were selecting them because they were the closets thing to real stone costing thousands of dollars less. 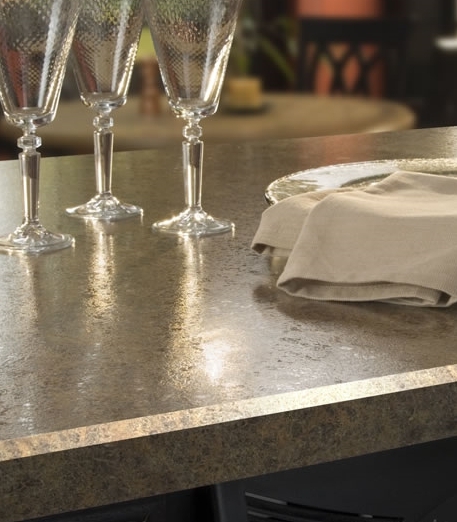 Have you heard of the beveled edge laminate tops? The bevel design is now one of the most popular selections available on the market. Custom plastic laminate fabricators can order the beveled edge molding and use it to build countertops to their customer’s specifications. The edges are sold in twelve foot (12′) long pieces that are one and a half inches (1-1/2″) wide by about five sixteenths of an inch (5/16″) thick. They are glued onto the ninety degree front edge of the Formica plastic laminate counters with yellow glue during the manufacturing process. In my expert opinion, I believe that the beveled edge countertops are the best selection that a customer can make. The reason I believe this is that there is more flexibility to customize the tops in comparison the post-form counters. There are pros and cons to each laminate counter style. You will have to weigh the benefits and disadvantages in relation to your budget and personal tastes. I can say this though, custom always costs more than stock. So, of the selections on the market, the granite plastic laminate patterns are by far the most popular choice by homeowners for their laminate kitchen countertops. 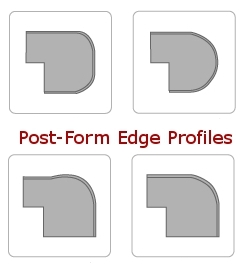 The rolled over edge, post-form tops with the integral backsplashes rank high on the popularity scale. The beveled-edge laminate kitchen counters are in high demand as well.